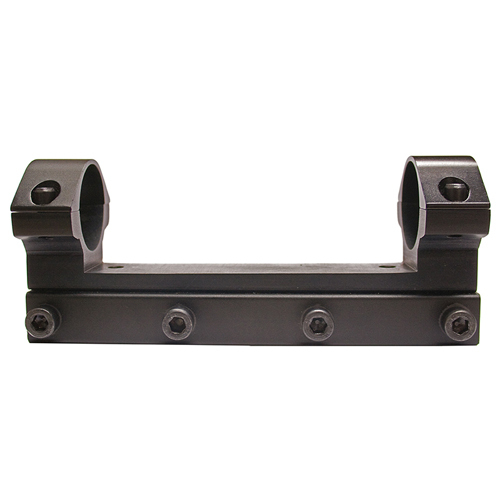 The RWS Lock Down is the ultimate in scope mount design for today's magnum spring guns. A very sturdy mount is necessary to prevent creep in the scope mounting system. This is due to the harsh recoil generated when the main spring is unleashed during shooting. Aircraft Grade aluminum was the chosen material for producing the RWS Lock Down. The mount utilizes a generous quantity of 4 mounting lug screws to ensure an extremely rigid fit. These screws are #1 Grade (English Standard) hex head design and are more than large enough to withstand the abuse dealt out by the rifle and the user. The RWS Lock Down is designed with 2 recoil pins to provide extreme holding power. Once these pins drop into place and the mounting lug screws secured, you can be assured of a maintained zero. The RWS break barrel rifles are engineered in such a way that the barrel is at a slight downward angle in relationship to the receiver tube and the receiver tube is where your scope is mounted. In order to place the scope in a parallel line with the barrel requires the rear of the scope be elevated. There is .030 of elevation built into the RWS Lock Down so that the shooter experiences no problem with elevation adjustment in their scope. Additionally, the mount has been tested on the fixed-barrel side cocking RWS rifles with great success. The new RWS Lock Down mount is an excellent addition to the RWS line of premium products and will make scope mounting a simple task.